“I have to go there!” I wrote in the margin beside this sentence written by Aldo Leopold in 1934: “If civilization consists of cooperation with plants, animals, soil, and men, then a university which attempts to define that cooperation must have for the use of its faculty and students, places which show what the land was, what it is, and what it ought to be.” He was talking about the newly-dedicated Arboretum not far from the campus of the University of Wisconsin in Madison. Rather than the usual collection of imported trees, Leopold’s vision was for a new kind of arboretum, which would recreate the ecosystems of “original Wisconsin” so that they could be widely seen and scientifically studied. That sentence is one of fewer than 50 sentences in his very short essay “The Arboretum and the University,” published in December 1934 in the journal Parks and Recreation. Although short, the essay is packed with a handful of big ideas. One of those big ideas is that the mission of a university should be “the invention of a harmonious relationship between men and land.” Of course, he was speaking of women too – today we might say “humans” instead of “men.” He argued that that requires a place where students can gain “a visual knowledge of the land’s history,” and he and his colleagues attempted to create such a place at the Arboretum. In late June, on a road trip west, I deliberately deviated north from the most direct route to my destination so I could finally realize the determination expressed in my marginal note. A wild turkey crossed the road in front of the car just before I reached the parking lot at the Arboretum Visitor Center, where I met the director, Karen Oberhauser, and the ecologist and research program manager, Brad Herrick, who gave me a quick orientation to the place and its mission. A light mist was falling as we walked out toward the original prairie restoration area, Curtis Prairie, said to be the oldest restored prairie in the world. Historic photos from the 1930s show Civilian Conservation Corps workers digging up former farmland to seed and plant native prairie species and Leopold and his students conducting controlled burns to promote their restoration. Today everything was green and wet – unusually wet, in fact, and we tiptoed around flooded sections of the trail and saw other sections with gullies washed open by runoff from the surrounding urban neighborhoods in the Lake Wingra watershed. 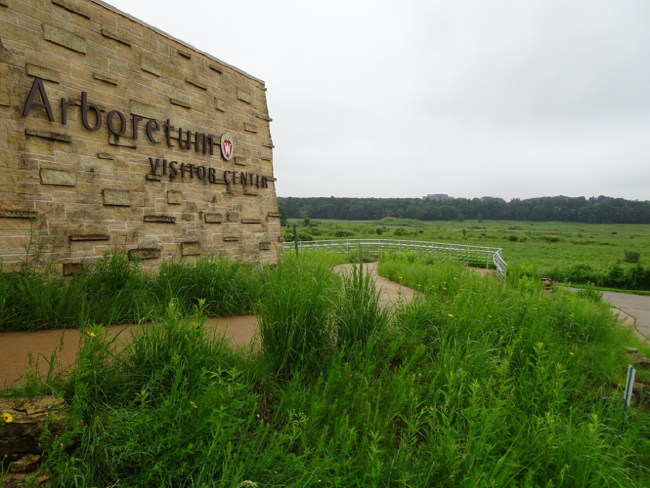 The Arboretum is now about 1,200 acres in size and has almost 20 miles of hiking trails through its diverse habitats, which include prairies, marshes, oak savannas, and deciduous forests. Arboretum Visitor Center overlooking Curtis Prairie, 20 June 2018. 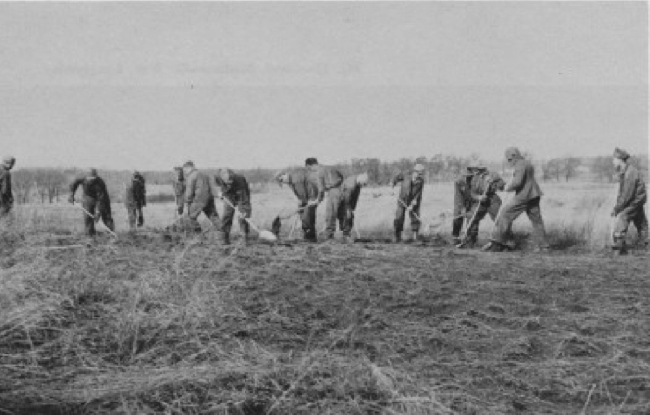 Civilian Conservation Core crew spading the soil of an old farm for seeding and planting Curtis Prairie, 1935. Photo courtesy of University of Wisconsin-Madison Arboretum. On the edge of Curtis Prairie, Brad pointed out an area that was burned last fall in a prescribed burn. 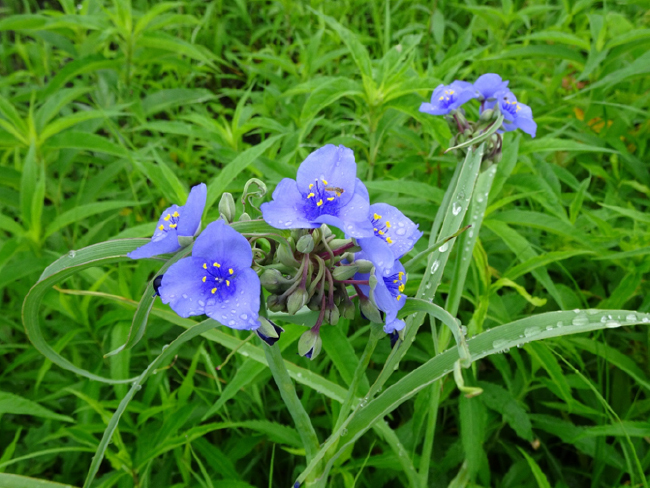 It was now spangled with constellations of the sky-blue flowers of spiderwort, Tradescantia ohiensis. Spiderwort obviously thrives after fire, similar to the fire-released blanketflowers, Gaillardia aristata, that I’ve studied in Colorado and written about in earlier essays. Spiderwort in a recently-burned area of Curtis Prairie, 20 June 2018. In his address at the dedication of the Arboretum in June 1934, Leopold described why this was so different from other arboreta. “Our idea, in a nutshell, is to reconstruct, primarily for the use of the University, a sample of the original Wisconsin – a sample of what Dane County looked like when our ancestors arrived here in the 1840s. … What I want to try and picture today is why it is important to the future welfare of our state to know what it was like before we took it away from the Indians.” In his remarks he goes on to describe how different the ecosystem around the Arboretum would have looked a century earlier – so different that current inhabitants of Madison might not even recognize that they were in Wisconsin, he said. The hill where the dedication ceremony was held would have been an “oak opening” – an open, orchard-like stand of mostly burr oaks with a profusion of prairie grasses and flowers in between. The marsh at the edge of Lake Wingra would have been a tamarack forest, “undergrown with sphagnum moss and orchids,” and the lake itself full of wild rice and waterfowl. Then Leopold asked “so what?” “Why study “original Wisconsin?” He answered his own question, saying “… because we are just beginning to realize that along with the intentional and necessary changes in the soil and its flora and fauna, we have also induced unintentional and unnecessary changes which threaten to undermine the future capacity of the soil to support our civilization.” He went on to say that “the tools wherewith we are building our civilization are so powerful, and their use has such complex and unexpected consequences, that we are tearing down about as fast as we are building up. It is an admission that science does not yet know enough, or is not yet sufficiently listened to, to anticipate and prevent this process of wreckage which attends our supposedly advancing footsteps.” This was another big idea, a prophetic warning from a prescient ecologist. It still rings true today – maybe truer than ever. Tradescantia ohiensis, Spiderwort, 20 June 2018. The version of his remarks from the dedication that Leopold eventually crafted into what was published in Parks and Recreation seven months later is somewhat different from what he presented orally. In some instances, the published version echoes and amplifies ideas from his speech. In the published essay, for example, he reiterates that “the scientist does not know the answer” to many ecological questions that he says are of national importance. But he also adds ideas not mentioned at the dedication ceremony. In the published version, a long paragraph discusses the concept of ecological interdependence, another big idea. “Plants, animals, men, and soil are a community of interdependent parts, an organism. … Mr. Babbitt is no more a separate entity than is his left arm, or a single cell of his biceps. Neither are those aggregations of men and earth which we call Madison, or Wisconsin, or America.” It follows from this concept of interdependence that when humans damage ecosystems, they are, ultimately, harming themselves. “No organism can survive the decadence of a member,” Leopold wrote. “Prairie Tapestry No. 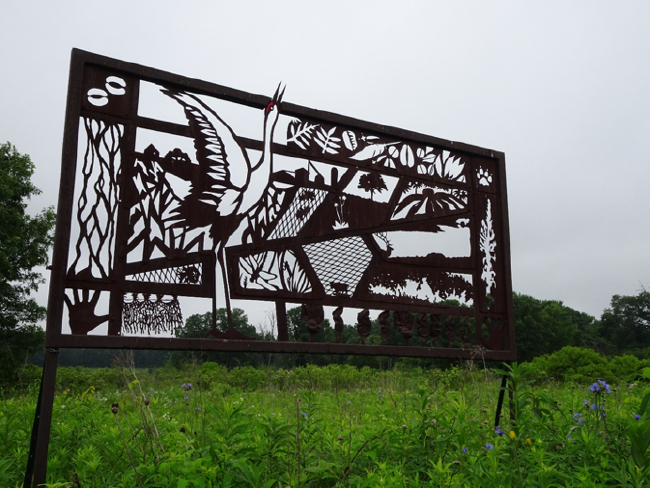 1: Crane Clangor,” ecological art by Glenn Wolff at the edge of Curtis Prairie, 20 June 2018. At the edge of Curtis Prairie, a work of ecological art attempts to convey this concept of ecological interdependence aesthetically. A large flat panel of rusting steel, cut with a welding torch in the silhouette-style of paper cutting, shows roots, leaves, flowers, insects, animal tracks, and human hands. An exuberant crane dominates the panel – and do you notice the tiny farm that spans it at breast height? This work was created by artist Glenn Wolff for a conference about North American prairies held in Madison in 2004. In his published essay, Leopold then leaps to another big idea. If it is true that modern technologies are causing unpredictable and potentially dangerous disruptions of ecological systems, ecologists have a duty to call for caution and conservation and insist that their science has an ethical and political dimension. “They are just beginning to realize that their task involves the reorganization of society, rather than the passage of some fish and game laws,” he wrote. In that radical statement, Leopold was way ahead of his time – many ecologists still shy away from engagement in public affairs and policy. In the carefully-tended native plant gardens near the Visitor Center building were a few tall prairie sunflowers that I recognized from an illustration in my old, yellowed paperback copy of A Sand County Almanac. 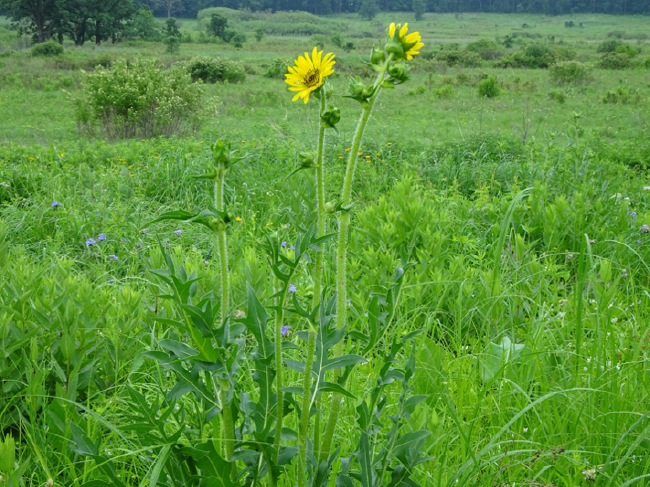 It showed a bison nibbling a compass plant, Silphium laciniatum. This plant plays a central role in Leopold’s “July” essay of the Almanac. Silphium laciniatum, compass plant or cutleaf Silphium, 20 June 2018. But Leopold’s efforts to restore “original Wisconsin” prairie at the Arboretum at least left a grave-marker of the “prairie epoch,” a cutleaf Silphium growing here for me to see. I celebrated its “prairie birthday,” and tried to imagine a bison gently nibbling it an arm’s length in front of me. And I made mental note that it was only the 20th of June and Silphium was already starting to bloom, almost a month earlier than in Leopold’s day. Climate change, anyone? Bison nibbling Silphium. 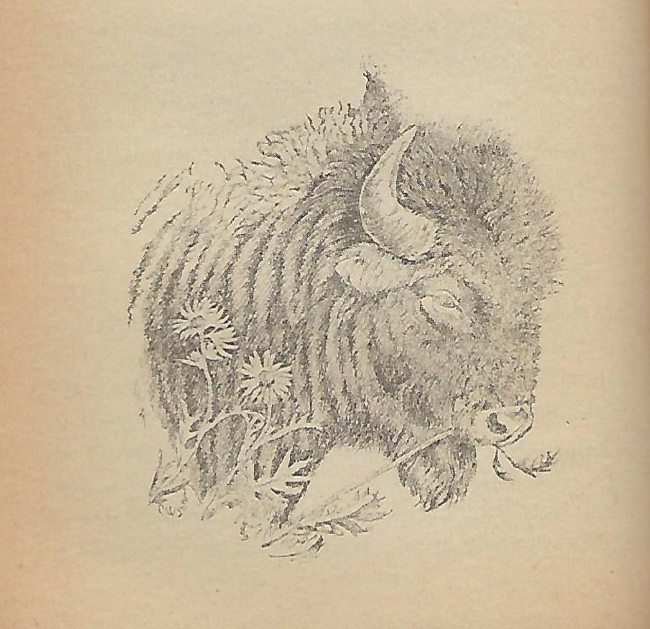 Illustration by Charles W. Swartz in A Sand County Almanac, Sierra Club/Ballantine Books edition, 1966. 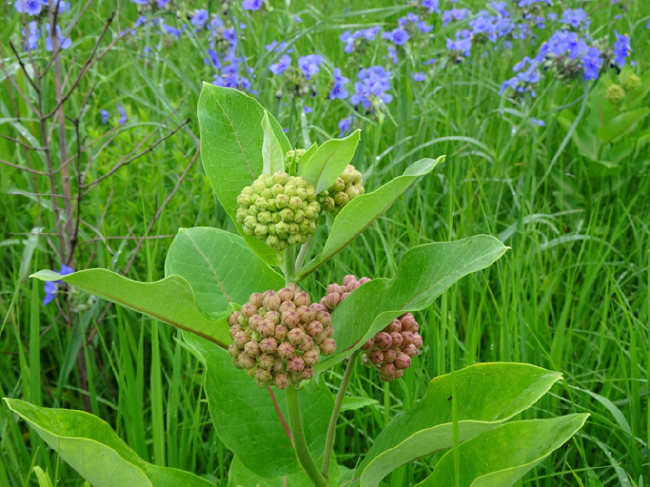 Besides being bison pastures, the prairies of the midcontinent, with their abundant milkweeds, once were the highways and pastures of the annual migratory tide of monarch butterflies that is now at serious risk of extinction. 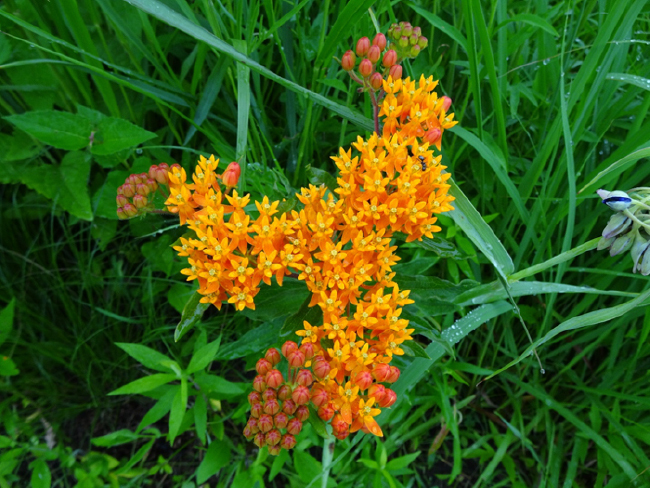 The bright orange blooms of butterfly milkweed, Asclepias tuberosa, were common in the Arboretum prairie, and pink firework-starburst blossoms of common milkweed, Asclepias syriaca, were just starting to open. On this cool, misty morning I didn’t see any monarchs. 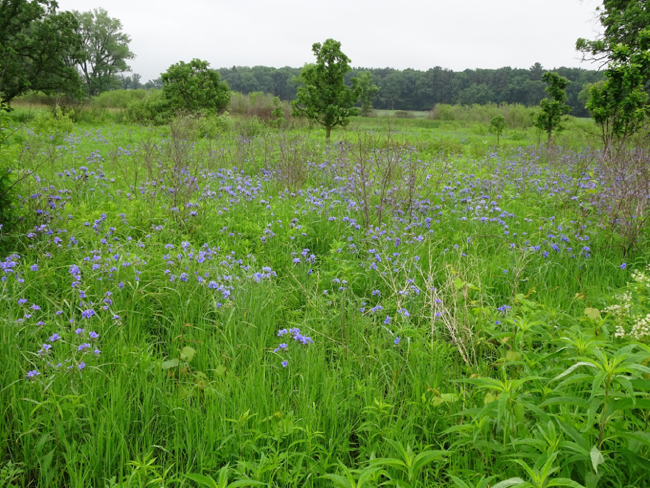 After my short walk in Curtis Prairie, I went to another area of the Arboretum called the Grady Tract, a hilly area where Brad said they had recently been putting a lot of effort into restoring the open oak savanna habitat that was once the most common ecosystem in southern Wisconsin. 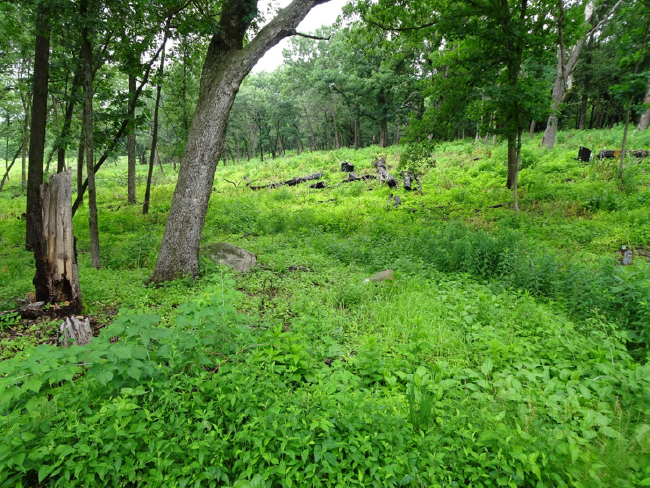 The restoration prescription was mainly thinning the overgrown woods and burning the understory to favor grasses and other fire-tolerant prairie plants. What I saw helped me imagine what the original European settlers of Wisconsin, including John Muir and his family, must have seen. My visit to the Arboretum reminded me of a 2017 consulting trip to Ukraine, where I went to the Askania Nova Biosphere Reserve in the steppe region in the southeast. The Eurasian steppe is that continent’s equivalent of the North American prairies. That experience had a resonance with Leopold and his prairie restoration efforts. The history of steppe conservation at Askania Nova reaches back more than a century, to Friedrich Falz-Fein (1863–1920), the eldest son of German settlers, who took over the family property after finishing his university studies. Falz-Fein developed Askania Nova into a huge sheep ranch, but in 1883 he also created an enclosure on native steppe for keeping wild steppe animals such as saiga antelope and Przewalski’s horses. He realized that the steppe ecosystem, and especially its fauna, were threatened and rapidly disappearing. After the Russian Revolution, the Bolsheviks confiscated the property in 1918, and the Falz-Fein family fled to Germany. Under Stalin, Askania Nova was divided into agricultural cooperatives, but a core nature preserve was maintained for studying the original steppe ecosystem, and it has been maintained ever since. The idea of protecting areas of “original” ecosystems in Russia and the former Soviet Union was the enduring legacy of Vasily Dokuchaev (1846-1903), a Russian geologist and geographer who laid the foundations of soil science. Dokuchaev also helped develop a unique Russian model of protected areas, called “zapovedniks,” which can best be translated into English as “nature preserves” or “nature sanctuaries.” Dokuchaev argued that setting aside areas of pristine natural ecosystems that can be studied and compared with managed ecosystems, such as agricultural lands or managed forests, was ultimately important for economic development, in case they could provide clues about how human actions were affecting natural processes. People and all economic activities should be excluded, he argued, and the areas should be protected so scientists could study their natural functioning. How many universities today would see their mission as educating their students to create ecologically-sustainable societies? How many ecologists understand that their real work involves the invention of such sustainable societies, and that one tool for doing so involves preserving and studying “original” wild ecosystems? How many politicians and policy makers understand our dependence on ecological systems, and insist that until we know better, we must conserve their component species to maintain their irreplaceable functions, upon which we all depend? Leopold was way ahead of his time; his prophetic warnings still ring true, and the challenges he recognized are still a long way from being solved. The Arboretum and the vision it represents stands as a milestone and monument, helping and prodding us along the way. Morning Visit with Aldo Leopold at the Shack. August 2016. Nature’ Warm Heart: Following John Muir’s Footsteps at Fountain Lake, Wisconsin. August 2016. Another Spring on the Ukrainian Steppe. April 2017. The River of the Mother of God and Other Essays by Aldo Leopold. Edited by Susan L. Flader and J. Baird Callicott, 1991. U. of Wisconsin Press. Pioneers of Ecological Restoration: The People and the Legacy of the University of Wisconsin Arboretum. Franklin E. Court, 2012. U. of Wisconsin Press. How nicely you tied the man to his native landscape through the arboretum. Thanks for this essay.